Hence below are 5 must try experiences that you have to try in Bangkok. Thai cuisine is now immensely popular across the world for its lightly prepared dishes, strong aromatic components, spiciness and balance in flavours. When in Bangkok just grab the chance to learn a few dishes from this cuisine that you can recreate in your own kitchen back at home. And the best place to visit for this is May Kaidee’s that has some of the best vegetarian thai food you’ll ever find in Bangkok. They run regular cooking courses that include an introduction to all the ingredients used, a trip to the local market, actual cooking, tips & techniques, recipes of a few dishes and then the final tasting. 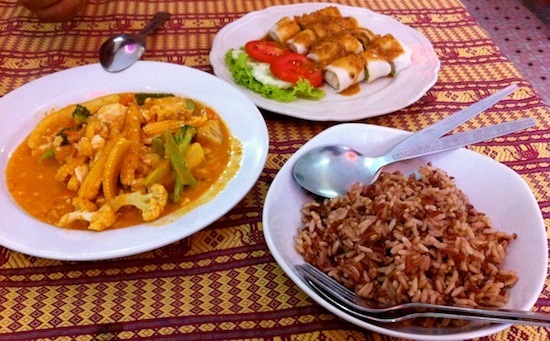 In case you don’t have time for a cookery class, then too visit this place for a delicious vegan Thai meal. 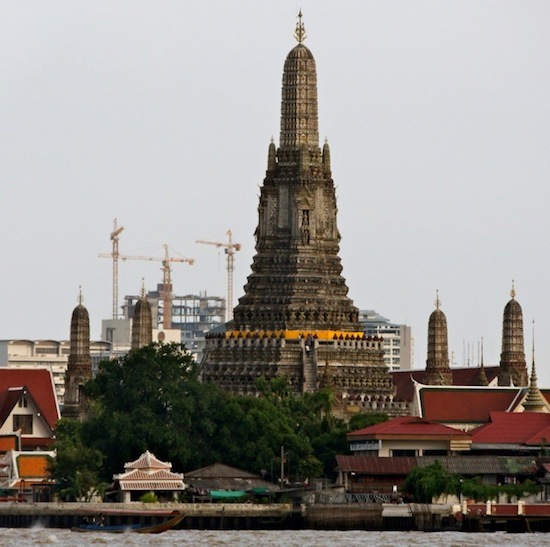 ‘Wat Arun’ or the ‘Temple of the Dawn’ is situated on the west (Thonburi) bank of the Chao Phraya River and is one of the most beautiful temples in Bangkok. It has a 70 meter high spire, built in a Khmer-style and decorated with tiny pieces of coloured glass and porcelain that are placed in an intricate pattern. It has steep stairs but I still recommend climbing up for the majestic views of the river and the city, the beautiful image of Buddha and the murals on its walls. Additionally if you visit early morning, there are no tourists around and you can actually watch the locals offer prayers, lotuses and incense. Traditional Thai massage is an integral part of everyday life in Thailand and hence widely available all across the country. But the best place to visit for an authentic Thai massage is The Wat Pho Thai Traditional Massage School, in the Wat Pho temple complex where students are still taught the intricacies and rhythmic movements required to provide a traditional Thai massage. Please be warned, that a traditional Thai massage is not like a typical spa but involves a lot of hard pressing and stretching and at times feels a bit strenuous (like a gym workout) but after the massage you actually end up feeling extremely relaxed and rejuvenated. Just a short drive on the outskirts of Bangkok is the largest Thai zipline canopy tour called “Flight of the Gibbon”. Here 3 kms of ziplines (over 24 platforms and the longest single zipline is of 300 meters) are interwoven through the jungle ecosystem in a rain forest where you can zip along the tree tops and actually feel how it is to fly through the trees like a gibbon. The price of the tour includes pick up and drop from Bangkok, a Thai lunch, a visit to the Khao Kaew Safari, walking through some sky bridges and abseil descents. This is a local weekend market that starts from Friday night and goes on till Sunday night. A complete shopper’s paradise where you can find everything under the sun – such as clothes; accessories; antiques; pets and even home accessories, basically anything. Apart from the shopping there are numerous local street food options available where you can have anything from coffee to fresh fruits to coconut water to ice candies. But be sure to bring the gift of bargaining along with you here. This post was written by Snigdha, a traveler, travel blogger and an amateur photographer based out of Mumbai, India. You can read more on her and her wanderings at Get Set and Go. If you'd like to try some unique experiences in Bangkok, take a look at our cheap flights to Thailand from just £399.